Our vision is to serve our guests in an enjoyable, comfortable setting and provide a delicious breakfast. Lilac Village Bed & Breakfast offers a place to unwind, be refreshed, and renew the spirit. Pattie was born and raised in Saint Paul. 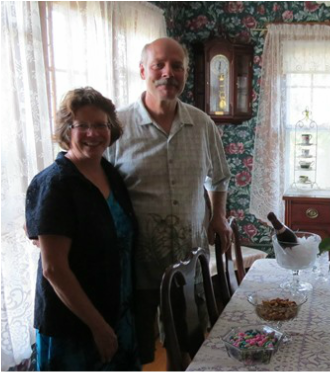 Hospitality is second nature to Pattie, and owning and running a bed and breakfast has been her passion for many years. Pattie likes to garden, swim, decorate, cook, and frequents second-hand stores. Neal was born in upstate New York and has worked for 30 years as an environmental scientist for the State of Minnesota. Neal likes to bicycle, fish, sail, motorcycle and woodwork, and does maintenance projects around the house.